Normally we see Sikh musicians doing Bhangra/pop style music, classical, or Gurbani Kirtan, but rarely do we see a Rock music as one of the musical styles. One of my friends, Hargobind Hari Singh started a Rock band called "Hargo" and he has been producing some awesome music. I have to admit, I don’t normally listen to Rock music, but the emotion, lyrics, vocals and tunes are really good and I highly recommend his new CD! I love seeing other Sikh youth who are driven and creative, aim towards their dreams (all while staying a Sikh). One doesn’t have to sacrifice their identity as a Sikh to achieve their goals in life. Be sure to visit the "Hargo" website and click on the "Media Room" option to hear some of his music. You can hear his whole CD online. Below is an article about him and his band from SikhChic.com. "It’s not an everyday occurrence when a father pulls his son out of college and tells him to start a band, but that’s exactly the case with Hargobind Hari Singh – popularly known as Hargo for short – a musical fixture around San Diego, California. Hargo, whose sound is described as a cross between Coldplay and his musical hero John Lennon, was pursuing a degree in psychology when his father gave him some advice that a student rarely hears. His father, Gurshabad Singh Khalsa, recalls, "When Hargo began his third semester at Mesa College, our talks about music came to a halt. Our conversations instead were about psychology; Freud’s cocaine habits, English essays and astrophysics, not songs and lyrics and what’s happening in the music world. I knew that if he was serious about the music industry, he couldn’t do both. So, being the best dad that I thought I could be, I told him to quit college and start a rock n’ roll band." Hargo had been playing from an early age. Even at age 8, Hargo had composed an original song called "Giving" which went on to be the official theme of the 1999 South Africa Peace Conference. Throughout his whole young life, Hargo has been writing and performing thoughtful original songs and impressing everybody who would listen. The timing seemed right to give an honest shot at a real music career, not just starting up some garage band. Says his father, "The time is now or never. The music industry doesn’t wait for people. You have to strike while the iron’s hot and he’s at an age where he can always go back to college if the music thing doesn’t pan out." This kind of family support at home is really paying off for Hargo. With his band together for well over a year, they have already played major local venues like Canes and Humphrey’s in addition to showcases at the John Lennon tribute, KLSD radio events and also sharing the stage with the B-52’s Kate Pierson, who is a fan of his music. Hargo has other famous fans such as Grammy-Award winner Seal and also New York Times Best-Selling Author Terry Goodkind who has become close friends with the young singer/songwriter. Hargo’s music and message has also won over the likes of California Lt. Governor Cruz Bustamonte and New Mexico Governor Bill Richardson. Hargo’s John Lennon connection is strong. 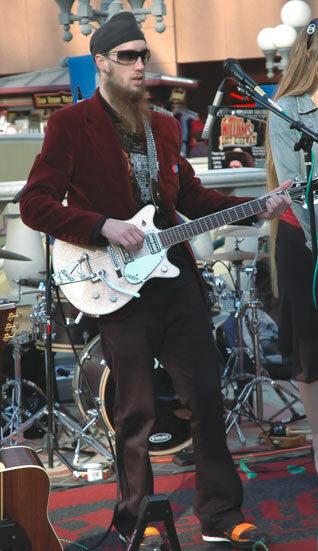 He has played at a star-studded KLSD radio tribute to John Lennon. The most popular song on Hargo’s new CD, In Your Eyes, is the single "Crying For John Lennon", its emotional message striking chords with Lennon and Beatles fans everywhere. The plan for success is to do everything possible to bring his songs to the masses and see if Hargo can make a significant musical impact and carve out a place for himself as a major performer and songwriter. It’s a similar plan to his paternal grandfather who played baseball in the St. Louis Browns farm system and was willing to give it five years to make it to the big leagues. His grandfather made it in his third year. Says Hargo, "We’re giving it that five-year period. At that time, if I’m performing acoustic songs in front of two people and an espresso machine, then I’ll reconsider." All indications appear that it won’t be the case. The same sense of empathy that initially led Hargo to pursue a degree in psychology also is found in his songs. That’s why he’s been lauded with praise from industry veterans such as "moving", "inspirational" and "your music is a pure reality." Whether or not Hargo hits his ultimate personal five-year goals, he’s going to move some people in the process. Like a true artist, he feels compelled to write, sing and say something while he can. Hargo sums it up with a sly smile, "You only get one chance in your life …." I did check his website and he has great voice. I wish him all the best. At the beginning of any career there are alway be hardships on the way, but humans have made impossible to possible with the grace of waheguru! Since he has a great voice ( obviously a gift from God), I was wondering it would be great that if he able come up Keertan CD sometime in the future with great music, which will resonate in everyone’s heart. Just a suggestion. Hmmm really nice music, keep it up hargo best of luck. I like all the songs. You are doing good for panth and Wahaguru bless you. I played a show with Hargo several months ago, and my wife and I found ourselves in tears more than once. As a musician putting it out there for non-violence, it’s nice to know I have brothers and sisters doing the same thing. I send him many blessings– thanks for the cool write-up! Honestly, I have not hear this rock band name yet. But as I read this article of yours, I can imagine that this band has a unique style of playing rock music and I am curious about it. I will try to visit his site and hope to have a free download of his music. “Crying for John Lennon” was co-produced by the legendary Phil Spector in-between court appearances and is as good a song as he ever had a hand in! Hargo is a wonderful discovery for everybody! Viva Hargo! Hello……I wasnt even aware abt this side of Sikh people and their devotion towards sikhi….the musician is more than amazing …please come down to India and here i have few friends in the indiustry and lets create something magical for Sikhi and Humanity with the most influential tool of music. Great to see this young talent in his full swaroop of sikhi and getting accepted and appreciated. You Rock…truly you have touched my heart and sikhi continues to amaze me. if not , still u r at ur own place,u r a ssikh. but u might be a khalsa if u bcome a namdhari.